Endocrine therapy is the treatment of choice in hormone receptor-positive breast cancer. However, the effectiveness of these agents is limited by the development of drug resistance, ultimately leading to disease progression and patient mortality. Cell models of endocrine resistance have demonstrated a role for altered growth factor signalling in the development of an endocrine insensitive phenotype. 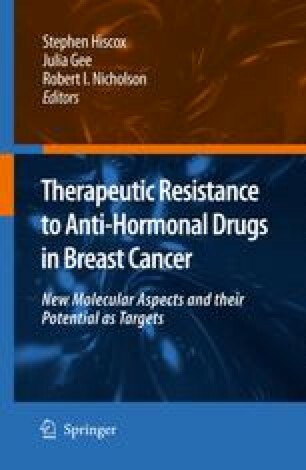 Significantly, recent studies have revealed that the acquisition of endocrine resistance in breast cancer is also accompanied by the development of an adverse cellular phenotype, with resistant cells exhibiting altered adhesive interactions, enhanced migratory and invasive behaviour, and a capacity to induce angiogenic responses in endothelium. Since invasion and metastasis of cancer cells is a major cause of mortality in cancer patients, elucidation of molecular mechanisms underlying the adverse cellular features that accompany acquired endocrine resistance and their subsequent targeting may provide a means of limiting the progression of such tumours in vivo.